Maybe you got up super early on Friday morning (or just never went to bed on Thursday) to shop for deals at your favorite stores. Maybe you also spent yesterday online scoring major deals for yourself (guilty) and family and friends. And now it's Tuesday and your chance to give back. Below I've highlighted some of my favorite non-profits that could use help today but also all year round. They all have a special place in my heart so please consider giving to them today, or looking for other charities that are near and dear to you. My dream vacation would be a safari. I've warned my bestie that when we eventually go I will likely just cry the entire time, I'll be so happy. Lewa Wildlife Conservancy would be part of that dream. If you don't follow them on Instagram you absolutely should. Every time I scroll past a picture of a group dining outside with wildlife in the distance I have to pause. It's just spectacular. But preservation and conservation costs money - employing armed rangers and their tracking dogs. If you would like to donate to their cause you can click here. 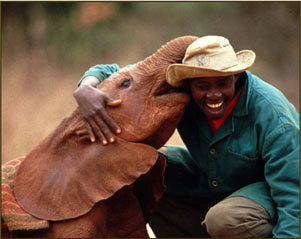 I am mildly obsessed with The DSWT. Okay, legitimately obsessed. I don't remember how many years ago I became aware of Dr. Dame Daphne Sheldrick and the amazing place she has created and nurtured but I am just smitten with the green-jacket wearing keepers and their tiny charges. If you follow their Instagram then you've seen many rescues of orphaned elephants and the process of trying to bring the scared baby back to health and happiness in the fold of other orphans. I think what gets me the most is when a graduate from the program brings back her new baby to be shown off. It's too much for me. I typically end up misty when I see those posts. Follow them on Instagram for adorable baby heffalumps wearing wee blankets, and donate here. Also, if you're a family member of mine, consider donating to them as a gift to me. Do you watch Pitbulls & Parolees on Animal Planet? One New Year's Day a few years ago there was a marathon on. I've been watching since day one but I had it on anyways and my mom and sister started watching. I left to go pick a friend up from the airport, came back a few hours later, and my mom and sister were still watching. I'm telling you, the show is addictive. Villalobos started in California but a few years ago moved to New Orleans. Through a warehouse and multiple sites outside of the city, they rescue mostly pitbulls (but also other breeds). Run by Tia Maria Torres and her family, which has grown considerably over the years, they strive to rescue and adopt out all of their charges. Click here to donate, or purchase something from their store here. It costs $8,000 A DAY to run the rescue. Their vet bill is astronomical, mostly because the dogs they rescue are almost always heart worm positive and heart worm treatment is not cheap. So anything you can give helps. While I'm only highlighting three charities today, there are so many more in desperate need of your help. If you want to help, this is a good place to start. You can search to find organizations near you or around the globe. Remember, every little bit helps. So be a part of #GivingTuesday.